At Caterpillar Cottage, the developing child thrives in the context of warm, responsive caregivers.They choose how they are engaged in a space that supports their inherent wellspring of creative, social, emotional, physical and cognitive skills. A child’s world and ideas are as big as life itself. In their play they are pirates, home makers, postal workers, construction workers. They are authors, painters, actors, engineers, caregivers, mentors, mentees and more. In every moment, they are figuring out how their physical world works, how their dailyness unfolds, how deeply they can feel as well as how deep the hole in the mud can go. Preschoolers jump into new challenges every day, because they are hard-wired to learn more all the time. They are developing new relationships, negotiating new roles, focusing in sacred solitude, finding their voice, and realizing that they matter to those around them. 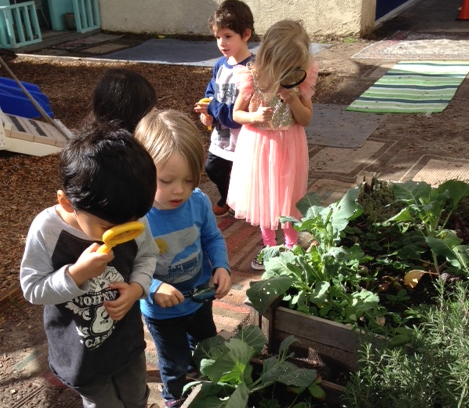 Preschool-aged children are ready for real-life physical, social, and cognitive problem-solving and experimentation. Their minds and bodies are not ready for sitting still in their chairs, following instructions, and doing drills to learn to read, write and multiply. But the deeper skills of concrete thinking and exploring that they pursue through creative play are laying the groundwork for future academic success. This is their opportunity for creating without regurgitation or justification, without tests and busy work. It hasn’t occurred to them that the experience isn’t enough; their activities are not a test of their worthiness. The young child is focused on process, wholly engaged, and not focused on creating a product or comparing themselves to others. In these few early years, we are handed an opportunity to support these developing human beings. We are given a window where we can support their joy of living, their sense of self and belonging in the world and as members of our community. These are the inspired seedlings of future teachers, scientists, parents, artists, and contributing community members. It is our job to give them the space and companionship to stay inspired. Their work is play, and it is what supports the health and development of their whole beings. This work is a vital ingredient towards their overall wellbeing and capacity to thrive.